when I returned from my Florida trip to visit my mom and sister. I knew I wanted something simple that I can later tweak to add autumn decor. I guess you can say this is my late summer, pre-autumn mantelscape. I took my inspiration (again) from the book Patina Farm. for the future autumn decor. and the small one was a gift from my friend Kris of Junk Chic Cottage. however, when I took a step back I eliminated them. Just wanted to keep it simple. and add the bread board vignette, it took about 10 minutes. Are you beginning to plan on how you will decorate for Fall? I know it is still August, but one can dream of the cooler days of Fall. Have a most beautiful day!! Love it. Simple, but with great texture. Funny, I’m doing a post this week on decorating with breadboards. 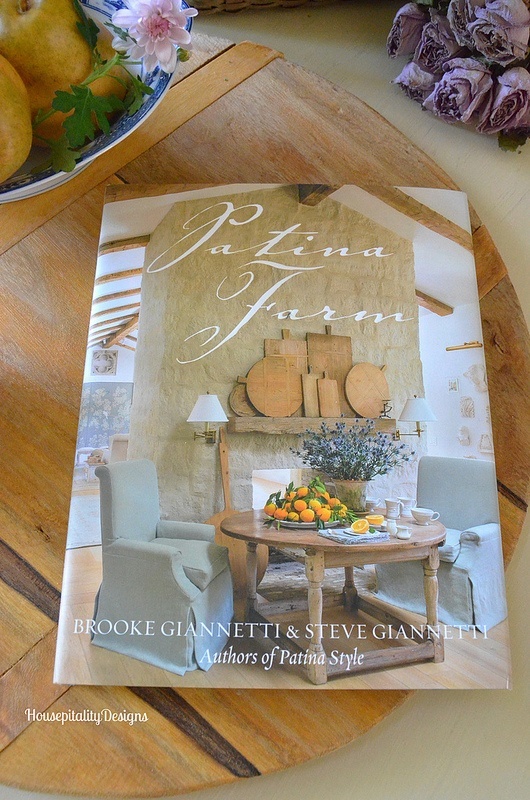 Love the fall mantel and love Patina Farms! Your mantle looks beautiful! I too am dreaming of Fall and have been thinking about Fall decor. I hope that you have a very Happy Wednesday!!! 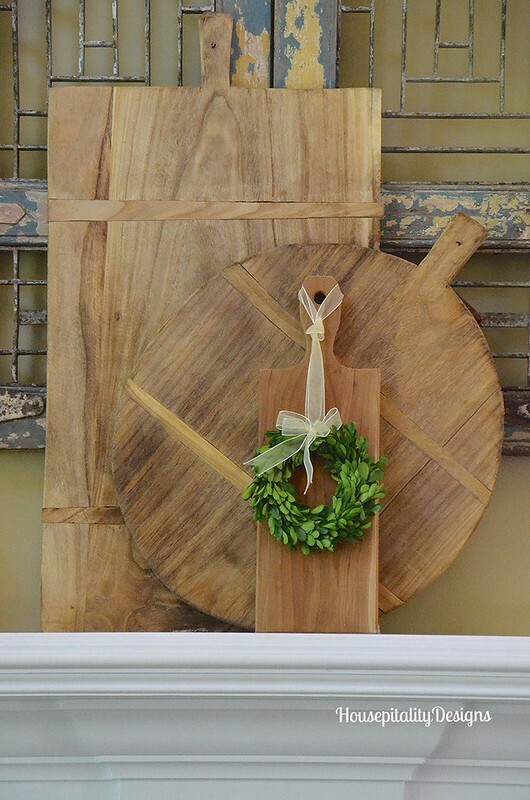 I love the way you layered the bread boards and added the little wreath! What a beautiful idea. When everyone starts decorating for fall at this point, it’s torture to me. It will still be 100ish here in Dallas for awhile. The only signs of fall are at Hobby Lobby! Loving your bread boards on the mantle. They are just perfect! And yes I am already starting to think of fall. LOL Mums are at my local garden center and it’s getting hard to resist buying them. I love the look of the breadboards on the mantel. I have a new addition to my thrift store shopping list…buy breadboards. Beautiful vignette, and you nailed the inspiration! You have me hooked. You have a most wonderful day, Shirley! Clean, simple, lovely and ready for fall. 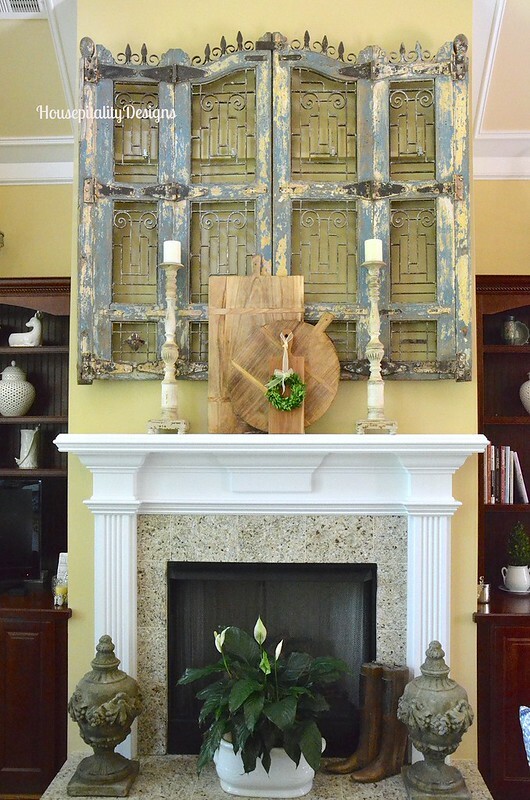 A little rustic elegance for the mantel. You always know exactly what to do. You put the “cool” in these hot days! Thanks, Shirley, for sharing your smart idea. I think they look great and would probably even say you could use this look any time of year. 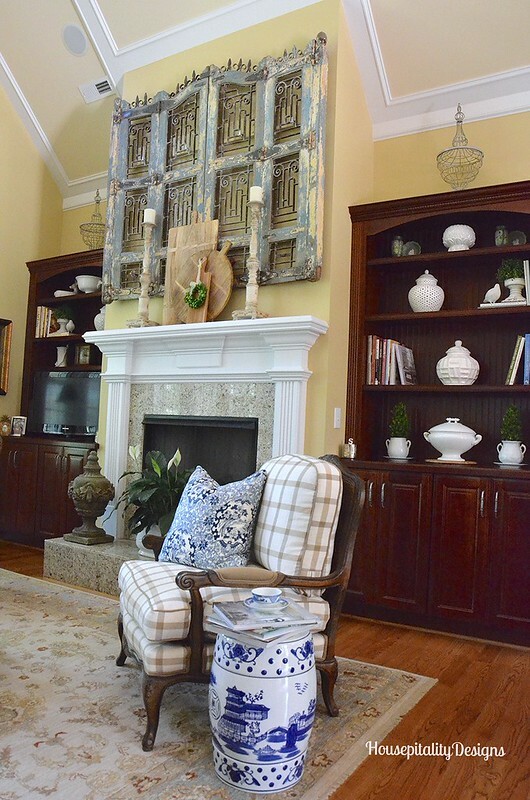 A great transitional vignette for sure. The bread boards look really good on the mantle. I am so ready for FALL that I can hardly wait. I have in my mind what I want to do. After this past illness it takes me forever to get it finished. I started cleaning out the garage and giving lots of Christmas and Fall items away. It’s not so hard putting up the items, it’s just taking them down. Enjoy your weekend and hopefully it will be cooler down your way. What a great idea! I, too, have a bread board collection but I’ve never thought of using them on the mantle! It’s perfect! I love your breadboards and am slowly working on a collection of my own. They are so versatile as you have so beautifully shown us. And that mini wreath is too precious for words. I like the way you are simplifying. I feel the need to get rid of a lot of my “stuff”. You inspire me! Simple makes a big statement here Shirley. So lovely. Happy new week. 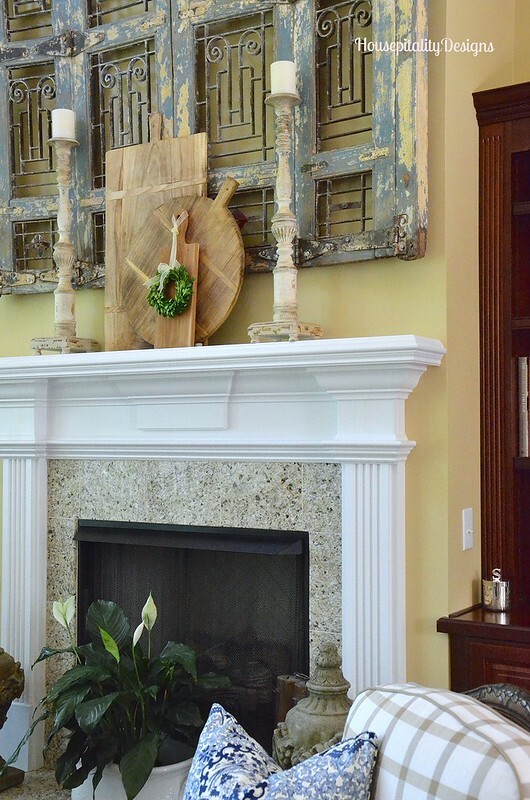 Shirley, love the between-the-season look of your mantel! Not wishing away my days, but cooler temps will be welcomed! Pam Richardson’s recent post…Tablescape Tuesday: Birthday Beach Bash! This is perfect transition for fall. I am loving the hot summers and not planning to do any fall decorations till September. I know I am a bad blogger!!! Love it Shirley. 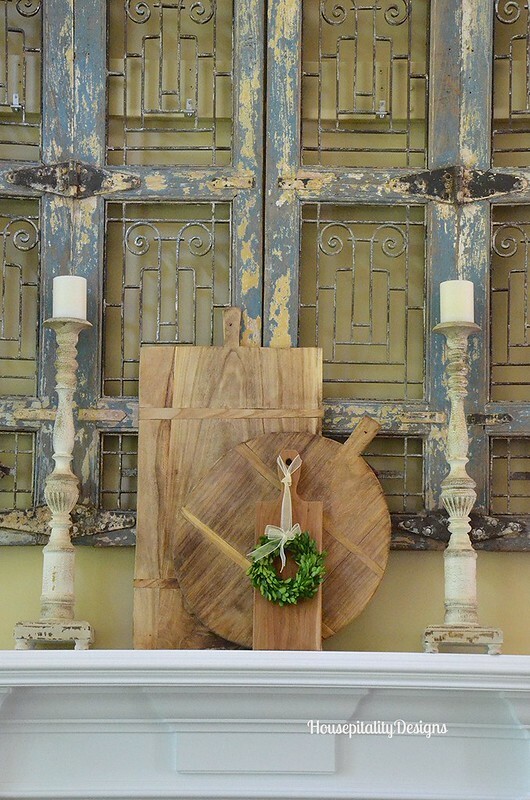 The bread boards add a nice warm and rustic touch. Will look amazing with fall foliage and pumpkins! I’ve kinda started by putting my amber candlesticks out on my mantle.lol As always I love your decor. OH! 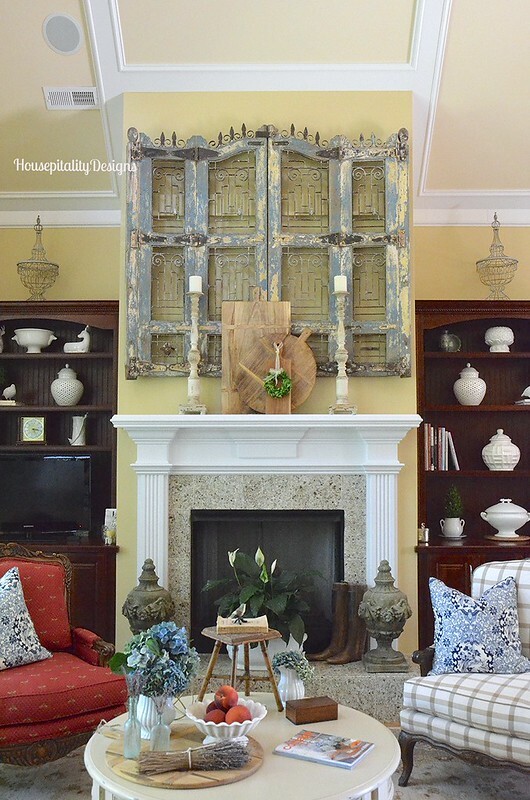 WOW the mantle looks so chic, I love that piece above the mantle, it truly make the whole design stand out! How different, it looks so attractive! beautiful, and the baby wreath looks fabulous, adds a pop of color. I’m ready for all things fall and would love a collection of old bread boards! Did you bring any back from your trip to France? Love it Shirley! I am trying to figure out how I can do a little autumn to share. Shirley, this is beautiful. I’ve always admired the large piece you have above the mantel. Love the idea of the bread boards. I’ve been thinking a little about how I will decorate for fall this year. I think I’ll have to stick to neutral colors since I’m using an OLD living room suite in pinks. I’m thinking some white baby pumpkins, and some burlap, that type of thing, and of course, I know I’ll sneak in just a little rust colors…..can’t help myself! But it will be different than usual because of my colors now. Can’t wait to see your fall mantel. I know it will be gorgeous! !